How can DNA analysis be useful to Czech Genealogy in 2018? I am having difficulty understanding how genetic genealogy can be useful for me *now*. I have a bunch of immediate (and distant) family that has tested on Ancestry. I’m in something like 77 DNA circles there, and so is my husband (different circles). I uploaded all of our (me, my husband, siblings, grandparents etc.) raw data to gedmatch. When I do the one to many comparison, I see lots of new people (at least, they don’t seem to often overlap with the Ancestry matches). When I use dnapainter to see where a match on gedmatch shares the same segments with me, I don’t see how it’s useful without knowing the MRCA of at least someone else who shares the same-ish segment(s). But like 90% of the people on gedmatch haven’t uploaded a gedcom, so that isn’t possible; why play with chromosome mapping when I have no idea who our MRCA is? Most of the gedmatch matches I’m talking about are matches at 10-30 cM’s, with a few around 100 and one at 400. But beyond giving me the name and contact info of somebody else who is related to me, I don’t see how knowing that is very useful yet. The thing is, I’m really mostly interested/obsessed with my Czech ancestors, which are only 25% of my total ancestors. None of my matches on gedmatch have slavic-sounding names (though to be fair, my married name isn’t either) and I only have a small handful of Czech close cousin matches on Ancestry, for all of whom we have discovered a MRCA through comparing “traditional” genealogy. Until more Czechs test, or upload their stuff to gedmatch, or upload a gedcom, how can this be useful to me now? This was my question to a super enormous 30k+ people Facebook Group called “Genetic Genealogy Tips & Techniques” on 11 March 2018. It has been two weeks since then and I have already found the answer to my question, so I would like to share it. But first: genetic genealogy is a long game, not a short game. It is completely different from all the other genealogical purchases I’ve made. I don’t buy my ancestry.com (etc.) membership anymore, since the LDS church made that deal in 2014. I guess it would be the most similar to that, but honestly, even then the analogy falls a bit short. What you buy when you buy a DNA test is the chance to participate in collaborative analysis of how you are related to other living (or recently living) people. You also get an ethnicity estimate, but that is basically in its infant stages for Czech genealogy, for many valid reasons including the lack of Czechs testing. Obviously, the more Czechs test, the more accurate the ethnicity estimates will become. But I didn’t want to know about *someday*. I wanted to know about now. DNA can be useful to me now in relation to my Czech ancestors by pointing me to other people who share the same common Czech ancestors. 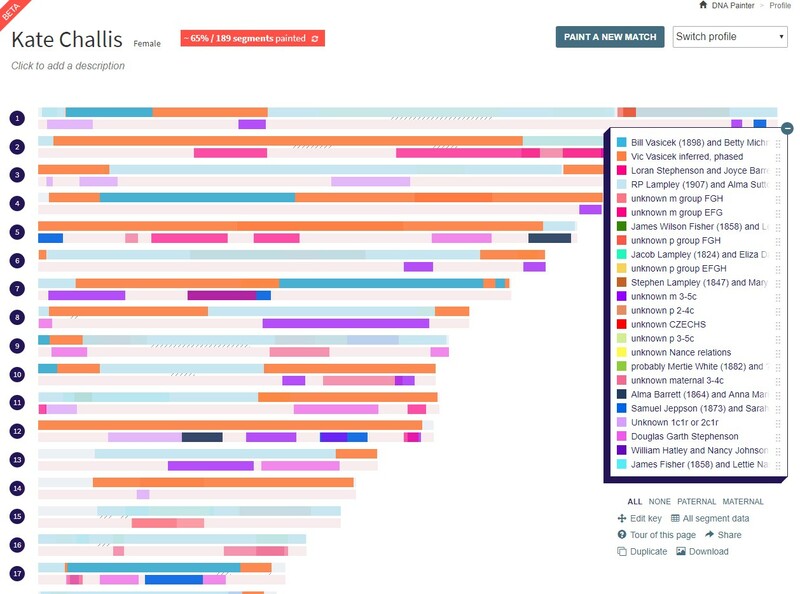 Discovering how we are related is still mostly a “paper” genealogy problem, and will be for anyone unless they find their biological sibling or parent through testing – amounts of shared cMs that can’t be misinterpreted or don’t have multiple possible relationships. Both sets of my paternal grandfather’s grandparents were the first generation of Czech immigrants to the United States. We expect him to be “100% Czech” or whatever that means. And we also expect there to be almost no other Czechness found anywhere else on my genome, except what I’ve inherited from my grandpa. I tested both my parents and my paternal grandma (my grandpa Vasicek died in 2003 unfortunately). This allowed me to infer what section of my chromosomes I inherited from my grandpa. I have been using this really great program called DNA Painter to do it, because it is pretty much a thousand times simpler to use than a giant table. All the bright orange sections labelled “Vic Vasicek inferred, phased” are pieces of me that are not from my mom or my paternal grandma, who is not Czech. Phased = good! Inferred = bad. That’s what my husband says, anyway. Here’s a nice pretty view of my Chromosome 1. My grandma is the light blue sections. I have lots of relatives testing who match with her. If I can discover the most recent common ancestor couple I share with my DNA match, that is how I label the segment I paint (the program also allows you to label them by their actual name). After one day of “painting” my matches from various places like gedmatch, myheritage, and family tree dna (why the heck doesn’t Ancestry have a chromosome browser!? It’s very annoying actually), I soon realized: hey! There are people here with whom I only share DNA from my grandpa: they must also have Czech heritage. I knew I had to figure out how we are related. Here’s my chromosome 4. Those two little green and yellow lines are actually duplicates from different sources. My cousin is on both My Heritage and gedmatch with different usernames; I’ll have to clean that up later. Oh yeah, and that red one? That is a segment I share with a Slíva relative who lives in the Czech Republic. They have not responded to my email yet. I am really excited to see how we are related. It’s actually been pretty hard and frustrating, to be honest. TWO of my Czech matches are adopted. Two! They are super nice and want to help solve the mystery of where exactly they fit into our Czech family, but they don’t have a gedcom with which I can compare. For other matches, it is like I have one partially finished puzzle with lots of pieces, my match has another partially finished puzzle with lots of pieces, and actually the puzzles overlap somewhere on the edge, so by comparing the puzzles together we can find how we match. With adoptees, it’s more like getting a piece of a puzzle which I absolutely know for sure, for sure must come from my puzzle (a 495 cM match and a 175 cM match to my father on the Czech side), but I cannot figure out where yet! To solve these two problems will definitely involve a lot of descendancy research, which is not something I’ve done very much. It is fun and challenging in a completely different way. the chance to be part of a community of people who are extremely intelligent. This matters to me. I *love* associating with extremely intelligent people, learning about really complicated science, and reading excellent analytical blog and facebook posts about this topic. It is very, very interesting to me. the chance to do something genealogically-related that is interesting to my husband. Yesterday we spend the entire day mapping out possible relationships on a giant whiteboard together. We both really enjoyed it, even though we didn’t solve it. My husband is a bioinformatics scientist, though his official job title is “statistical geneticist II” or something like that. He works with corn (soy, cotton, etc.) DNA. Rather, he writes computer programs that analyze the DNA. He used to work for the human genome sequencing center. I have been hearing about SNPs and illumina my entire married life. It’s fun to use these words in a context that matters to me. It’s also fun to share knowledge with him that he doesn’t know yet, but that is super interesting to him. The biggest challenges for me with genetic genealogy (so far) has been my lack of programming skills. I’ve been playing around with my genetic genealogy for about a month; we took these tests about a year ago but RootsTech 2018 helped me see some possibilities for how to use this data. And every day, multiple times a day, I think about how useful it would be to have a tool that does x. SIMPLE THINGS – not complex things. And if I knew how to talk to a computer, I would be able to make it do those simple things. But I don’t – yet. I was so incredibly encouraged by learning about the origins of DNA Painter on this little video clip of Jonny Perl at RootsTech (I talked to him there, too). He is a programmer, but didn’t know anything about genetic genealogy until pretty recently. And here he’s created the one tool which I’ve been able to use which has helped me to actually see how this analysis can be useful to me now. And guys, it’s a simple tool! I’m probably never going to be able to learn how to program useful tools, at least not anytime soon. But if I had enough knowledge of programming, I would be able to write some really great pseudo-code which would allow another programmer to create my tool. In short: there’s no shortage of interesting things to learn. More detailed posts about these Czech adoptee relatives of mine to come, for sure. In the meantime, I suggest that DNA can be useful to Czech genealogy today mostly because it can help you find collaborators who you wouldn’t otherwise have known existed because they live on the other side of the country or world, and some of them have no idea that they are related to you at all. Maybe someday we’ll be able to use DNA to break some of those 18th century record-loss brick walls, too. I believe that day will come.